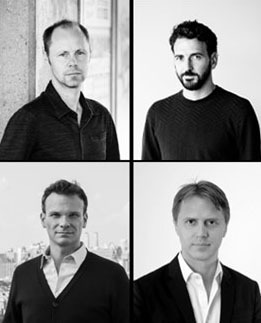 The Office for Metropolitan Architecture (OMA) announce that four male architects, Chris van Duijn, Ippolito Pestellini Laparelli, Jason Long and Michael Kokora, have joined the OMA partnership. The four newly appointed partners, all previously associates within the company, bring the number of OMA equity partners to ten, alongside Rem Koolhaas, Ellen van Loon, Reinier de Graaf, Shohei Shigematsu, Iyad Alsaka and David Gianotten. The larger partnership will be vital in leading international projects from OMAs offices in Rotterdam, Hong Kong, New York, Beijing and Doha; it coincides with the increasing number of OMA and AMO projects worldwide, and the offices interest in further intellectual exploration within and beyond the traditional boundaries of architecture. Chris van Duijn joined OMA in 2000 and is based in Rotterdam. He has been involved in many of OMAs most renowned projects including Universal Studios in Los Angeles, the Prada stores in New York and Los Angeles (2001), Casa da Musica in Porto (2005), and CCTV Headquarters in Beijing (2012). Ippolito Pestellini Laparelli joined OMA in 2007 and is based in Rotterdam. Pestellinis work and research at OMA/AMO has a focus on design, preservation, scenography, and curation. He currently leads the transformation design of the 16th century Fondaco dei Tedeschi in Venice, and developed Monditalia, a multi-disciplinary exhibition focused on Italy, at the 2014 Venice Architecture Biennale. Jason Long joined OMA in 2003 and has been based in OMA New York since 2007. After contributing as Associate Editor of Content (Taschen 2004) and acting as a key member of AMO in Rotterdam, he served as project architect and project manager for many of OMAs cultural projects in the Americas including the Quebec National Beaux-Arts Museum, the Faena Arts Center in Miami Beach and the Marina Abramovic Institute in Hudson, New York. Michael Kokora joined OMA in 2007 and is based in Hong Kong. In 2009, he established OMA/AMO Asia together with OMA partner David Gianotten. Within the Asia Pacific region, he is responsible for leading a large portion of OMA/AMOs portfolio and is developing projects in China, South East Asia, and Australia.